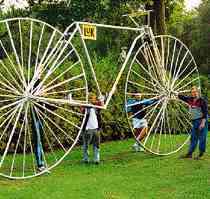 Didi Senft has built the world's largest bicycle and more than 100 other unusual and record breaking bicycles. 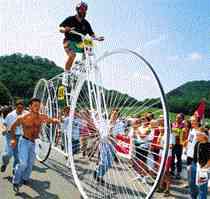 The largest bicycle was built by Didi Senft from Kolpin (Germany). It is 7.8 m (8 yd 1 ft 7 in) long and 3.7 m (4 yd 2 in) high. Didi Senft has built more than 100 unusual bicycles. He successfully took part in a lot of festivals and TV shows. 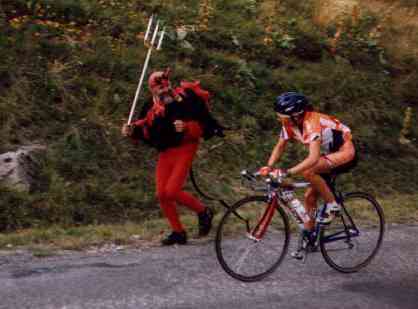 (Maybe you have seen him in TV as the devil of the Tour de France). With his collection of unusual bicycles, Didi was an attraction in many events around the world. Didi, "Le Diable" has visited all major cycling events in the last ten years: the Tour de France (since 1992) , the Giro d'Italia (since 1996), the Cycling World Championships, the Olympic Games 1996 and 2000, the Football World Championships 1994 and much more. Didi has always been a cycling enthusiast. In 1992, a dream came true: He visited the Tour de France for the first time, and he did so year by year. The most TV spectators know him as the "Devil of the Tour de France"